The Mr. Blizzard Capsule is a yellow Capsule found in Mario Party 5, where it can be thrown to a space on the board, or used on the player for ten coins. Its effect is that it makes Mr. Blizzard fall flat on top of them, making them lose all their Capsules. 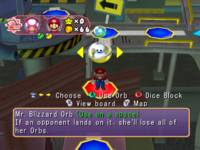 In Mario Party 6 and Mario Party 7, it is known as the Mr. Blizzard Orb that costs ten coins at the Orb Shop. It has the same effect, however. The description referring to affected players as female. In Mario Party 6, the description both in the instruction booklet and in the game refers to the affected player as a female.